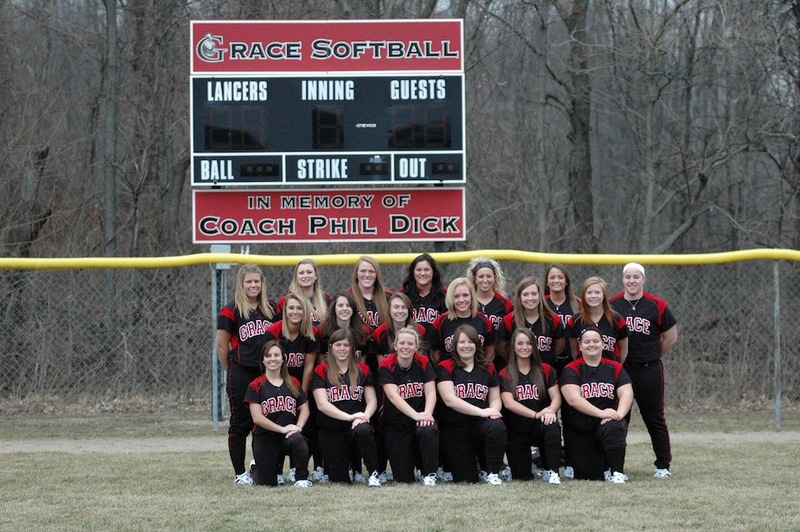 WINONA LAKE – An influx of talent to the roster of the Grace College softball team brings hopeful anticipation for the 2013 season. The Lady Lancers have added 10 new faces to this year’s campaign, many of whom will contribute immediately according to head coach Heather Johnson. Grace, who won five league games last season, is hoping to build on the team’s best record in the Crossroads League since 2005. Under Johnson, the program has improved its finish in the league standings each season. In order to continue that trend, the Lady Lancers will look to the leadership provided by senior Sam Fields and junior Olivia Winget. Fields is close to capturing the program’s all-time hit record. Her three-year total of 123 hits is 12 behind Kelli Irish’s record of 135. Winget already cemented her name atop a Grace record in 2012 when she became the first Lady Lancer to drill double-digit home runs in a season. She led Grace in multiple offensive categories including batting average (.324), hits (48), home runs (11) and slugging percentage (.588). Johnson’s nine-player freshman class is expected to pay dividends on the field in 2013. Highlighting the newcomers is Danielle Wellman, a catcher from Wapahani High School who was named the Star Press Softball Athlete of the Year as a senior. Paige Petrone (Valor Christian HS, Colo.), Lacey Little (Madison-Grant HS, Ind. ), Morgan Cody (Archbold HS, Ohio), Alex Shipley (Brownsburg HS, Ind. ), Cali Young (South Central HS, Ind. ), Chelsea Whitesell (Terre Haute South HS, Ind. ), Amanda Bowman (Northwestern HS, Ohio) and Bridget Poteet (Ben Davis HS, Ind.) add a tremendous amount of depth at nearly every position. First-year Lady Lancer Brooke Shell has potential to start immediately in the outfield. Shell initially signed with NCAA Div. I IPFW last season before deciding to transfer to Grace. Juniors Tiffany Featherston and Jordan McKinley have taken major strides during the offseason, according to Johnson, and will figure to be major contributors to the roster. Grace will have to overcome multiple underclassmen starters and increase their run production to find success in 2013, but Johnson is confident of the team’s ability. The Lady Lancers begin their season at the Union College Tournament from Barbourville, Ky., on Feb. 22.